Challenge 26: Present at a TeachMeet. Once you’ve found a TeachMeet in your area, there will usually be a sign-up form to present (Usually in the form of a wiki or google doc). TeachMeet presentations are done by volunteers (In most cases, practising teachers) and are usually either 7 minute ‘micro-presentations’ or 2 minute ‘nano-presentations’. Presentations are usually chosen at random on the night using a random name selector or by simply picking names from a hat. Keep It Simple – TeachMeets tend to attract tech minded teachers – probably due to the fact that much of the advertising is done through social media. However, your presentation doesn’t have to be techy – in fact, the less techy, the less that can go wrong. Also, your 2 or 7 minutes also includes your setup time. Stick to your allotted time – Make sure your presentation doesn't go over your allocated time. 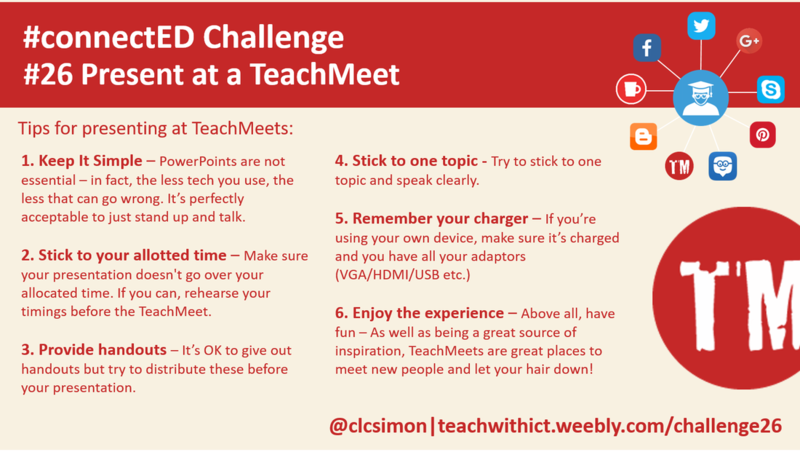 If you can, rehearse your timings before the TeachMeet. Provide handouts – It’s OK to give out handouts but try to distribute these before your presentation. PowerPoints are not essential – It’s perfectly acceptable to just stand up and talk. Stick to one topic - Try to stick to one topic and speak clearly. Enjoy the experience – Above all, have fun – As well as being a great source of inspiration, TeachMeets are great places to meet new people and let your hair down!